World mountain bike downhill champion Gee Atherton has admitted he is "a bit ashamed" to have raced while suffering the effects of concussion. 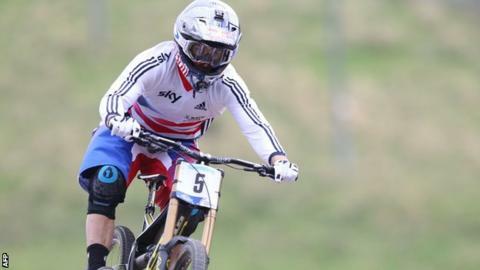 Atherton says head injuries are his biggest fear as he prepares to defend his title in Andorra on Sunday. But the English racer, 30, insists the sport is trying to improve its care after accidents. Atherton told BBC Sport: "Everyone is more aware of the dangers and the potential for things to go wrong." Atherton says that the Great Britain team has people in place to make sure riders don't get back on their bikes "too soon" following an accident. But he admits he has not always taken that level of care. The Wales-based rider said: "I was in a race in New Zealand when I crashed on the qualifying day. I knocked myself out and sat out for the rest of the day feeling rough. "Stupidly the next day was race day and me thinking I am Superman I jumped back on the bike thinking I would be fine and ended up crashing and having another concussion. "It ended up putting me out for a much longer period of time. It had the potential to be very serious. "I was feeling the effects of it for quite a while. It's a bad way to learn a lesson but I definitely did learn the lesson and it's something I won't repeat." Atherton is optimistic about defending the elite men's title he won at last year's world championships in Norway. He added: "The track there really suits me. I have won there before and a had a second place before so I am going in feeling like it's got potential to be a good race." Atherton's sister Rachel, 27, is also competing in Andorra and is favourite to win the elite women's race after winning six of the seven races on the calendar to become world cup champion. She will face competition from GB team-mate Manon Carpenter, who won the title last year.